In roughly 50% of lamps the bulb markings are clearly visible, but some lamps either have the bulb orientated so you couldn’t read the markings without a dentist’s mirror. If the bulb orientation differs we would be suspicious as this is a rare practice and has been used to hide the markings from casual inspection. 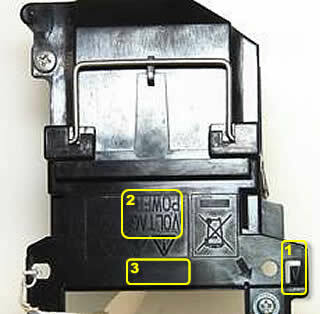 Some bulbs are in enclosed units which require the lamp to be taken apart to see the markings. If you are suspicious, we suggest you experiment by taking the old housing apart until you can see the bulb markings. If this was straight forward and you can put the lamp back together again you could repeat it on the new lamp, however please be confident first. If you handle the new lamp, be careful not to touch the burner that sticks out the reflector as oily deposits on the quartz can cause hotspots and shorten the lamps’ life. Beyond the bulb markings there are other ways to either identify a counterfeit lamp that are either conclusive or by the weight of evidence make you feel that you have a fake. We do advise caution when making a judgement based on advanced identification guidance. Although it is uncommon for a projector manufacturer’s lamp to be constructed differently there will be times when they change production techniques, components or even the mould used for the plastic cage. It is only the weight of evidence and often the poor quality of the components used that lead us to conclude a counterfeit lamp and we urge you to use the same impartial judgement when using these guidelines. 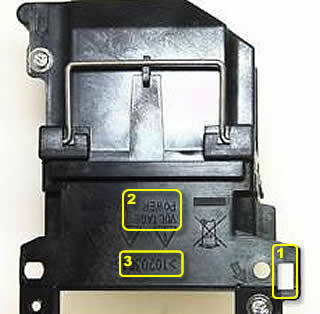 ** Note that the last two are made by splitting up a genuine lamp and its’ packaging to make two counterfeit OEM lamps. As well as checking the bulb markings, in most cases the plastic or metal ‘cage’ should be pretty much identical showing it came from the same molding tool. There are often tell-tale signs that the suspect lamp didn’t come from the same mould as the original lamp. E.g. 1. Cut out a different shape. 2. Text in a different font. 4. Symbols are different in design and location. 5. Markings from moulding machine should always be in the same place. 6. Air grills should be the same design. Are the boxes and packaging the same? The same weight of cardboard, the same shape of cut outs and folds. Labels should be identical as would instructions sheets even to be folded the same way. The lamps would have the same inner packaging. With any rule there’s often an exception so these guidelines aren’t definitive and it’s often the number of discrepancies in the packaging and construction that lead us to identify a fake. If you’re unsure and would like guidance we are happy to help, just contact your local Just Lamps sales office with your concern.